I debated about how much to reveal about The Joneses, a satirical comedy about the wanton consumption habits of folks who live in affluent suburbs. After a few minutes of hand-wringing, I opted for saying little about the Joneses, except to note that director Derrick Borte has made a movie that’s obvious, a trifle distasteful and too eager to cop out in the final going. 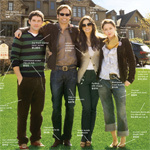 David Duchovny and Demi Moore play a perfectly matched husband and wife who, in the picture’s opening moments, move into a perfect new neighborhood with their two high-school age kids (Amber Heard and Ben Hollingsworth). When the Joneses open the door to greet their next door neighbors (Glenne Headly and Gary Cole), Duchovny and Moore are smiling so broadly, we immediately suspect that something untoward must be lurking beneath the movie’s surface. We soon learn the family secret (no, I’m not telling), and the movie turns into an assault on blind consumerism of the kind suggested by the title; i.e., the push to keep up with the Joneses. How this story plays in an improving but still distressed economy is anyone’s guess, but The Joneses tempers its satirical bite by delivering a finger-wagging message. Duchovny acquits himself well. Moore, of course, looks fit, but it doesn’t take long for the movie to be weighed down by the behavior of its characters. I wouldn’t want them for neighbors, and I was sorry to have spent a couple of hours with them.